Delicious. It’s a dish that would be warm and comforting to a newly orphaned boy, yet different enough to showcase the culinary skills of the Sanza brothers and to take a reader into the world of Camorr. The sauce, for me, was part of what made this dish sound so appealing. I’d been keeping an eye out for fresh figs, and when I finally found some, I knew I had to make this recipe asap. The final dish is a fascinating combination of sweets and savories. The onions and garlic infuse the chicken from the inside out, leaving the tender meat savory with flavor. I wasn’t sure that the flavors of the stuffing would pair well with the sauce, but it actually works quite well. On its own, the chicken tastes of the stuffing, but with the sauce, and a bit of fruit, it becomes a sweet bite, all but overpowering the more savory elements. Cook’s Notes: Capon, while different from chicken in flavor and texture, is not essential to the enjoyment of this recipe. Feel free to substitute a chicken! Preheat the oven to 400F. Stuff the bird with the small onions and the garlic, then rub down the outside of the bird with olive oil, followed by a generous sprinkling of salt and pepper, which crisps up the skin. Roast in the oven for around an hour, or until the juice runs clear. For the sauce, drizzle your olive oil in a medium sized frying pan, over medium-high heat. When the oil is hot, add the grapes. Cook, stirring for several minutes, until the grapes appear slightly wrinkled and cooked. Add the figs, and continue to stir for another minute more, but stopping before the figs start to fall apart. 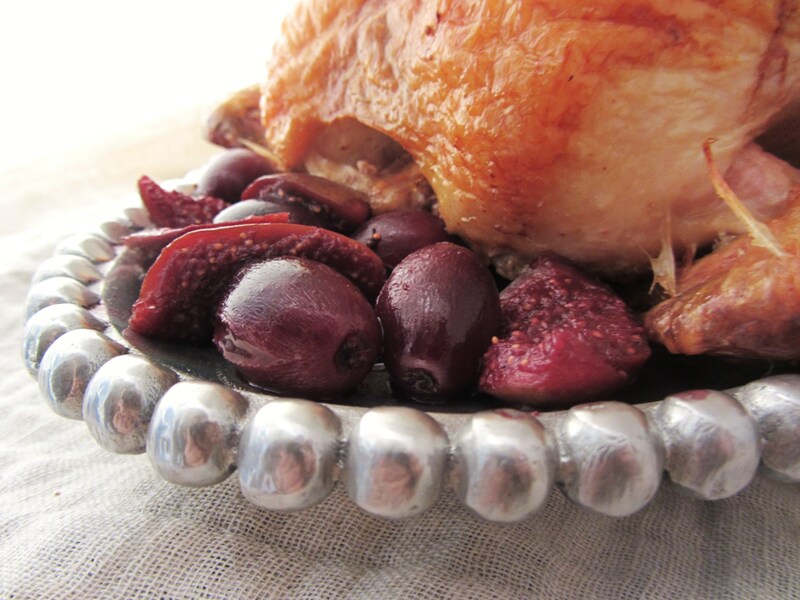 To the roasted fruits, add the wine, spices, honey, and vinegar. Simmer this mixture until the sauce begins to thicken a bit, about 30 minutes or more. Serve as an accompaniment to the roast chicken/capon. Like this recipe? Check out the other recipes from the Gentlemen Bastards series! Very nice! I love the Gentlemen Bastards novels (too sad there seems to be a bet between Lynch and Martin who takes longer to finish a book *g*). I find it interesting that the garlic and the fruity flavors work so well together as it seems – I should check foordpairing.be on what they have to say about that (or eel and caramel).